CONRAD AND MELCHIOR LINKS DISCOVERED!! Hello, Yoder cousins of North Carolina and the wider South! Yes, the mystery man of your ancestry, the elusive Conrad Yoder, has been found, identified, and placed in the European and American Yoder network. After a century or more of unavailing search for Conrad by North Carolina kinsmen, in particular Col. George Yoder and his grandson, Prof. Fred Roy Yoder, the Conrad Yoder Mystery is solved. This is how it all happened. Be patient and you will get the full and exciting details. Let's go back sixty years in my own research career. In 1950, that glorious year of my life when I made my very first visit to Germany and Switzerland, I took my first fascinated look at the Palatinate, that little Rhineland state that our Swiss Yoders chose as a "haven of refuge" whether they were Reformed, Mennonite, or Amish. On that first visit I paid my initial respects to the little town of Mussbach where an important international land-transfer was made in 1771 (see details later). I met the mayor, Dr. Sartorius, owner of the principal vineyard, and acquired a taste for the local wine, Mussbacher Eselshaut, which I have never lost! And Mussbach, as you will soon learn, is an important waystation in the life of Conrad Yoder. But how did I locate the mystery man? It's a long story, and I must tell it in some detail. During that first 1950 sojourn in the Palatinate I had the good fortune to meet Richard Louis, the publisher, of Ludwigshafen, who that year initiated the editing and publication of the genealogical journal with the title Pfälzische Familien- und Wappenkunde (Palatine Genealogy and Heraldry), which some years later changed to Pfälzisch-Rheinische Familienkunde (Rhenish Palatine Genealogy). (A genealogical aside: Dr. Louis, I found, was a descendant of the distinguished Belgian Protestant family of Louis of Otterberg, from whom my mother was also descended, so we were kinfolk!). Because of this connection I was given a subscription to the journal, now accumulated into several boxes representing over sixty years of issues. Since in my busy life I was not always able to go through each issue thoroughly, I decided in 2011 that now was the time. I got up as far as 1986, and guess what I found! In Pfälzisch-Rheinische Familienkunde, Volume XXXV (11:2), August 1986, on pp. 87-90 there appeared an article by Dr. Alfred-Hans Kuby entitled "Schweizer und Schweizer Abkömmlinge im Reformierten Kirchenbuch Mussbach bei Neustadt" (Swiss and Swiss Descendants in the Reformed Church Register of Mussbach bei Neustadt). Dr. Kuby is undoubtedly the foremost Palatine genealogist as well as the foremost Palatine church historian, and our gratitude to him for what he discovered in the Mussbach church register is unlimited. This is what he found: "JODDER, NIKOLAUS, + vor 1740, Sohn KONRAD lebt 1740 in Weidenthal, 15 Jahre alt". Translation: "NICOLAUS JODDER, died before 1740, Son KONRAD is living in 1740 in Weidenthal, 15 years old". This means that Conrad (as we spell the name) was an orphan just 15 years old living in the family of his older brother, Nicolaus Joder Jr. of Weidenthal, whose children were baptized in the Reformed Church of Weidenthal. And Nicolaus Joder Sr. (1673-before 1740) was the brother of Hans and Jost Joder of Oley in Pennsylvania who opted to stay in the Palatinate and died there. Hence the long lost Conrad Joder was the nephew of Hans and Jost, and undoubtedly lived with his kinsmen in Oley from 1746 when he emigrated, until (according to tradition) he moved to North Carolina with Henry Weidner in the 1760s. CONRAD'S FATHER, NICOLAUS JODER SR.
What do we know about Conrad's father? He was the son of Adam and Barbara (Ochsenbein) Joder of the Ortbühl Farm at Steffisburg in the Canton of Bern, Switzerland and a grandson of Nicolaus Joder (1609-1680) and his wife Anna Trachsel. Bernese Joders were a clan of skilled mechanics, millers (they ran several of the Steffisburg mills), and expert farmers, gifts which they brought to Pennsylvania. Nicolaus Joder's father Adam Joder operated the fulling mill at the Schnittweier Bad, on the mountain back of Steffisburg to the North, where he used the hot water that issued from the town's bath. There's a story there that I won't go into. But there are several gaps in our knowledge of Conrad's father. We do not know when he left Switzerland for the hospitable Palatinate, we do not have information on his marriage, and we do not know exactly when he died. We do know, from the Kuby article, that he was connected with Mussbach and probably lived there. Through the magnificent will of Daniel Joder of Upper Hanover and later Hereford Township, dated 1783 (see details later), we know who his children, the brothers and sisters of our Conrad, were. The oldest son was Johannes Jotter (as he spelled his name) of Mussbach, who through a curious inheritance law operative in Pennsylvania, inherited land in Oley and transferred it back to his first cousin, Hans Joder Jr. (1700-1779), son of Hans Joder Sr. (1672-1742) of Oley, who emigrated from Schwetzingen in the Electoral Palatinate in 1709, arriving in Pennsylvania very probably in 1710 (see YNL5). Johannes Jotter, Conrad's oldest brother, is a kind of mystery man too. According to the Mennonite Census Lists, published several times in America, he was a Mennonite, hence his children do not appear in the records of Mussbach's Reformed Church. He appears also in the Palatine Census Lists of the Oberamt Neustadt in 1721-1722, with property, so he must have been born before 1700. Because of this, it is possible that Nicolaus Joder Sr. was a Mennonite also, since the Kuby reference appears to be the sole reference to him in the Mussbach church books. It is in my opinion more likely that he was Reformed, and his marriage and children's baptisms took place at another village in the Palatinate, and that he settled in Mussbach toward the end of his life. I am working on all this, so be patient. The Mennonite connection is no problem, since some of our Joder families were an interdenominational mixture of Reformed and Mennonite adherents. The 1771 deed can be summarized here, but I intend to publish it in its entirety in translation, with all the background material, in a future issue of the YNL. I am hoping even to locate in some German archive the original Vollmacht or Power of Attorney made by Hans Joder Jr. (son of Hans Sr.) and taken to the Palatinate by Hans' first cousin Jacob Joder (1735-1804) of Oley, Jost Joder's son. It appears that Hans Joder Sr. got from the Penns a Tract of 461 acres at Oley, which in his will he divided between Hans Joder Jr., son of his first wife, and Daniel Joder, son of the second wife. Daniel died intestate and without issue in 1747, and the English law did not permit the land to go to the half brother in Pennsylvania, but rather to the nearest relative of Hans Joder in Germany, hence, since Hans Sr.'s next brother Nicolaus was dead, it went to Nicolaus's oldest son, Johannes Jotter of Mussbach bei Neustadt an der Haardt. Curious indeed. Hans Jr. paid his German cousin one thousand Reichs Gulden for the property, and the matter was settled. Jacob Joder testified to the Berks County Court later in 1771 that he was "there" and saw Johannes Jotter sign! DANIEL JODER AND HIS "BELOVED COUSINS"
Daniel Joder (1731-1783) was a weaver by trade who settled first in Upper Hanover Township, Philadelphia (now Montgomery) County, and ended up in Hereford Township, Berks County. His importance to us is that he wrote a fantastic will in 1783 (see YNL16), naming and giving legacies to his Joder relatives, his "beloved cousins" as he calls them. Daniel was unmarried with no children of his own, so he left his somewhat considerable estate to his kinfolk. Daniel was a grandson of Nicolaus Joder Sr. (1673-before 1740), brother of Hans and Jost Joder of Oley, through a son whose name unfortunately we do not have. Daniel emigrated in 1764, on the Ship Hero, from Rotterdam and Cowes on the Isle of Wight, arriving at Philadelphia October 27, 1764, when he signed the ship's list of passengers (males over 16 years), at the State House, now Independence Hall. As to his religious connections, he may possibly have been Mennonite, since on the ship list several suspiciously Mennonite surnames appear before and after his signature -- Brenneman, Brubacher, Riesser, Kägy, Krebil, and Stauffer. However, the names signed immediately before and after his signature are very probably not Mennonite-- Kunkelmann, Seitz, and Breuninger. His will does not mention his religion, and thus far in my researches into Montgomery County sources, I have not located his religious affiliation. We owe the preservation of Daniel's will with its indispensible key to the Nicolaus Joder Sr. family relationships, to David Shultze, whose wife was one of Daniel's "beloved cousins". David translated the will into English in 1784, which with the original estate papers in David's neat 18th-century script, are preserved in the Schwenkfelder Library at Pennsburg, Pennsylvania. Now for the analysis of this key document. The will is dated April 20, 1783, and in it Daniel is described as "of Upper Hanover now Hereford Township". He names as executor of his estate his "beloved cousin" John George Lahr, who was the son of Daniel's aunt, his father's sister Maria (Joder) Stürtzmann, widow of George Henry Lahr. Her son Philip Lahr is mentioned in the Shultze Diaries as David's hired man on his farm. 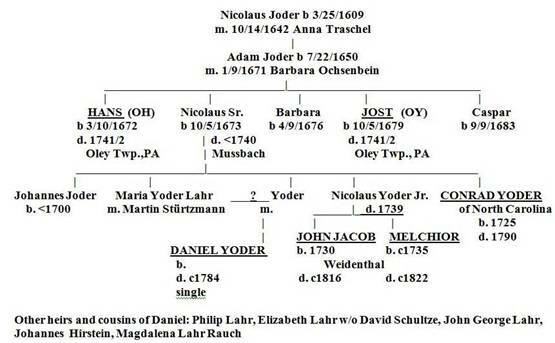 Further, the will mentions Daniel's "beloved cousins John Jacob Yoder and Melchior Yoder," who as I learned from my discovery of the Weidenthal Reformed Church records many years ago, were sons of Nicolaus Joder Jr. of Weidenthal in the Palatinate. (see YNL41) He also named John Hirstein as a "beloved cousin" (more about him later, a fascinating find!) And lastly, he mentions Magdalena Rauch and Maria Rosina Schell. For these relatives he used the dialect word "Basel"- an old-fashioned affectionate diminutive of Base, a now archaic word meaning a favorite female kinswoman, an aunt or cousin, in this case cousin. They were it turns out, daughters of Daniel's aunt Maria (Joder) Lahr Stürtzmann. Witnesses to the will were Johannes Roeder and Abraham Meyer. Abraham Meyer (Mayer now Moyer), 1705-1786, was a son-in-law of Jost Joder of Oley (see YNL57) and Johannes Roeder was probably Abraham's grandson, son of Michael Roeder who married a daughter of Abraham. Klock, a pioneer settler of the Mahantongo Valley of Schuylkill and Northumberland Counties. Yes, these Yoder connections migrated over the Blue Mountain to Mahantongo, where they joined their kinfolk, my Oley-Mahantongo Yoders, who got their first land in that beautiful and historic area in 1802 (I have the original parchment deed!). And Klocks and Yoders intermarried in Mahantongo! (See YNL 14). Maria Joder Stürtzmann is turning out to be interesting indeed. She was married twice, first to George Heinrich Lahr by whom she had sons John George and Philip, and at least two daughters, Magdalena and Elizabeth. Magdalena of Hereford Township married Heinrich Jacob Rauch, usually known as Heinrich Rauch (1731-1783). Second was Elizabeth Shultze, the second wife of David Shultze the "bush lawyer"(see YNL16). More about these kinfolk later. These Rauch materials are from the recent volume, Rauch Family History, by Donald Lloyd Norwood and William Hardy Rauch (Dallas, Texas, 2007); and from the Leavitt manuscripts at the Berks County Genealogical Society. Maria's second husband, Martin Stürtzmann, arrived in Philadelphia September 11, 1738, on the Ship Robert and Alice from Rotterdam and Dover. His signature appears in Lists 55 A-B-C in S-H, I, 213, 214 and 216. The name is botched in the Captain's list (A), in B it appears as "Hans Marden Starzman" and in C as "Hans Mardin Sdartzman". The spelling using "a" instead of "ü" reflects a dialect pronunciation. Please note that the surname is not "Stutzman" as mistranscribed in the YNL, Stutzman, which of course is also found in Pennsylvania, is an entirely different surname with no biological relationship to "Stürtzmann". It may be possible to find Martin's place of origin, since on the same ship there were Hatts and Reitenauers, whose origins we do know. And note that I have reams of material on Conrad's sister Maria, with many known descendants, all of whom can be welcomed into the Yoder Freindschaft. Johannes Herstein, named as "Johannes Hirstein" among the "beloved cousins" in Daniel Yoder's will of 1783, was a nephew of Conrad Yoder, the son of a daughter of Nicolaus Joder Sr., whose name is thus far, alas, unknown. The Herstein (Hirstein/Hierstein) family were Mennonites, but not of Swiss background, for the name does not appear in the six-volume Swiss Family Name Book (Familiennamenbuch der Schweiz). Johannes Herstein is listed twice in the Strassburger-Hinke Pennsylvania German Pioneers. His first arrival was in 1773, on the Ship Union, from Rotterdam and Portsmouth, landing at Philadelphia on Sept. 27, 1773 (S-H, I, 753). Cousin Johannes could not pay his passage, so as a redemptioner he was indentured for four years, for the sum of 19 pounds, 13 shillings, and 8 pence. And guess who picked up the tab - "Lazerus Widenor" of Oley Township, Berks County. Again, the Yoder Connection was there, since Lazarus Weidner's wife was Elizabeth Joder, daughter of Jost Joder the Oley Valley pioneer. In the Indenture Records, which were inscribed in Philadelphia's City Hall, Johannes' name is given in Anglicized form as "John Herstone". These records were published in the yearbooks of the Pennsylvania German Society, Vol. 16 (1907), pp. 314-335. In 1791-1792 Johannes Herstein returned to Germany, to oversee the publication of an important devotional book for his Pennsylvania Mennonite compatriots. The volume was a book of sermons by Jacob Denner entitled Jacob Denners Christliche und erbauliche Betrachtungen über die Sonn- und Festtags- Evangelia des ganzen Jahrs, nebst einem Anhange verschiedener Predigten über besondere Texte, sowohl aus dem Alten als Neuen Testamente; und einer Vermehrung von dreyen Predigten über das heilige Vater Unser. Durch Gottes Gnade in öffentlicher Versammlung in Altona mündlich vorgetragen, und auf Begehren dem Druck überlassen (Frankenthal am Rhein: Ludwig Bernard Gegels, 1792). According to Mennonite historians, this sermon book was issued in a special edition of five hundred copies, at the expense of and supervised by Johannes Herstein and Johannes Schmutz. Herstein must have made out in America, to be able to pay for the printing of Denner's sermon book! The pair also purchased 500 Basel Bibles and brought the lot to Philadelphia on the Brig Henricus, which sailed from Amsterdam and arrived at Philadelphia September 22, 1792 (S-H, III, 54). Johannes Herstein is listed among the American Passengers, and Johannes Schmutz and Barbara Herstein among the non-Americans. Yes, Cousin Johannes also brought back a wife to Pennsylvania! John C. Wenger, in his book The History of the Mennonites of the Franconia Conference (1937), tells us amusingly what happened to the books. "They divided the books between them each taking 250 copies of the Bible and 250 copies of the sermons and started out to sell them… Herstein visited the brethren in Montgomery and Bucks counties and quickly disposed of his lot. Smutz visited Lancaster county and after a fruitless effort to sell the books he returned home very disgusted and still having nearly all of his books, remarking when he met Herstein, 'If you want to sell anything in Lancaster county you must bring them a drove of oxen; they sell better than Bibles.'" Our thanks to the Mennonite historian Alan G. Keyser, who had worked on Herstein and furnished most of the above material. He added, "The story may be just a story, because quite a number of this edition of Denner's sermons are found in Lancaster county Mennonite homes." The blanks in Johannes Herstein's life continue to intrigue us, and I promise my readers that I will continue the search for his Palatine origins, and the name of his Joder mother, Conrad's sister. In the Mennonite Census Lists, of the 17th and 18th centuries, the originals of which are in the Baden State Archives at Karlsruhe, there are several Hersteins listed in Palatine villages. I'll be searching for them on my next visit to Germany! There was also, according to the Mennonite Encyclopedia, a Herstein's Mennonite Meeting House in Montgomery County that was undoubtedly connected with Cousin Johannes. More about that later. David Shultze (1717-1797), called affectionately the "bush lawyer," meaning a self-trained lawyer, surveyor, and skilled preparer of wills, deeds, and agreements, was one of the Schwenkfelder émigrés driven from their native Silesia by Catholic bigotry in 1726. After a sojourn on Count Zinzendorf's estates in Saxony, they emigrated to America in 1734, settling in what is now Montgomery County, with outlying settlements in Berks and Lehigh. Since the diaries that David Shultze kept, written into interleaved Saur almanacs (! ), are a major source for Conrad Yoder research, we must analyze very carefully David Shultze's connection with Conrad. In a letter I wrote to Dr. Fred Roy Yoder in 1952, I quoted the Conrad Yoder references and thus alerted him to their existence and their extreme significance for anyone attempting to investigate the mystery man Conrad Yoder. My quotations in that letter were in Shultze's original German text, from an incomplete version of the diaries published beginning in 1900 by Henry S. Dotterer in his regional periodical, The Perkiomen Region. Dotterer attempted to reproduce the diaries in their original fascinating form, since Shultze used German, English, and Latin in his texts. The full diaries have been published in a complete translated form by Andrew S. Berky, former Director of the Schwenkfelder Library, in two volumes entitled The Journals and Papers of David Shultze (Pennsburg Pennsylvania: The Schwenkfelder Library, 1953). Berky added to the actual journal material various documents prepared by Shultze as "bush lawyer," which importantly rounded out the historical picture. 1. September 6, 1774: John Mayer arrived from Carolina on the 6th after 20 days march with a letter from Conrad Yoder (II, 78), (John Mayer was a grandson of Jost Joder through Jost's daughter Catharina who married Abraham Mayer, a neighbor and friend of David Shultze.). 2. September 28, 1774: John Jacob Joder was here and I wrote a letter to Conrad Joder in Carolina (II, 78) (The visitor was very probably Melchior Joder's brother, a first cousin of David Shultze's wife.). 3. June 24, 1780: Letter to Conrad Joder and John Eckle via Heilig via Lobwesser via J. Wyant in Carolina (II, 120), (This sounds like a circuitous route, but David Shultze undoubtedly knew all these persons and was assured that his letter would be delivered.). 4. July 25, 1782: Sent a letter to Conrad Joder in Carolina with Michael Weidner (II, 155). (Michael Weidner was a son of Adam Weidner of Oley who had joined his first cousin Henry Weidner in North Carolina, and was a neighbor of Conrad Joder there.). 6. March 1790: Conrad Joder in Carolina also died this year in April or May. One Borneman told me this (II, 208)(This establishes the year of Conrad's death, and my research has established the year of his birth - 1725. Hire that stonecarver and add the birth date to Conrad's memorial stone!). These references are of course indispensible materials on Conrad Yoder, and the thought of the numerous letters that passed between them is exciting. If we only had some of them we could certainly decipher more of Conrad's life patterns. But the number of letters that passed between David Shultze and his wife's uncle is significant. Perhaps he was a favorite uncle- who knows? To close this section on "bush lawyer" David Shultze and his many Yoder connections, I wish to report that two more years of his diary have turned up, those for 1743 and 1744 -- before the published diaries begin. They are at the American Antiquarian Society at Worcester, Massachusetts, both properly encased in Saur almanacs. They were discovered by Alan G. Keyser, who with Alan Viehmeyer, Director of Research for the Schwenkfelder Library, is preparing a new translation and expansion of the Shultze Diaries. Full speed ahead on this invaluable project! Col. George M. Yoder (1826-1920), the grandfather of Dr. Fred Roy Yoder (his other grandfather was also a Yoder, making him a double Conradite! ), must have been an interesting character. Distinguished not only for his service in the Confederate army, but by a lifetime of service to his community, his involvement with Yoder history and genealogy is what intrigues us. Not only was he interested in his Yoder background, but he became an important local historian, with his long years of newspaper column production, dealing with Catawba County history. Col. George's usual take on Conrad was that he must have been a Mennonite, since he brought with him a "Mennonite hymnal" (where is it today and was it Mennonite?). That may have been so, but when he emigrated, Conrad was only 21, and according to the ship lists could not write, hence probably at that time could not read either. As an orphan put to work in Weidenthal, his formal schooling may have been neglected. It is of course documentable that some of Conrad's close relatives were Mennonites, like his oldest brother Johannes of Mussbach, but his next oldest brother Nicolaus Jr. of Weidenthal was Reformed, and evidently Conrad was living with his family in 1740. But Col. George's knowledge of the colonial Yoders in Pennsylvania seems to have been remarkably wide. For example, he certainly knew of the Oley Yoders, and he was aware of Melchior Yoder, who has turned out to be a nephew of Conrad. Col. George could of course have heard of Melchior through his (George's) grandfather John Yoder who was Melchior's first cousin. It is always remarkable to me when I consider how much knowledge of past generations of our families was never written down, yet survived in the memories of kinfolk. As to the Melchior problem, Col. George even owned a copy of a rare and invaluable (for Melchior research) church history of Snyder County, Pennsylvania, which featured Reformed and Lutheran Union churches that Melchior and his sons were connected with. My own involvement in Conrad Yoder research goes back at least to 1941 (! ), when my father, Jacob H. Yoder (1883-1959), received a letter from Wallace A. Yoder of Litchfield, Illinois, dated July 10, 1941. He begins with this note: "My sister Lois Yoder who teaches English in the Decatur, Illinois High School recently observed in the school library your book on engine equipment, and knowing that I was the family historian also transportation man, having forty nine years service as agent for the Illinois Central she gave me your address, and I take the liberty to inquire if you would have some data on your ancestors." The book he refers to was Locomotive Valves and Valve Gears (New York, 1917). Wallace was obviously descended from Conrad Yoder since he gives a bit of Conrad's history, but unfortunately uses the incorrect emigration date of 1751 instead of 1746. Through the years I received other letters from Conrad descendants, saved them all, and will analyze them in my Historical Introduction to the new edition of the North Carolina Yoder genealogy. The lengthy correspondence that I had with Dr. Fred Roy Yoder, then at the State College of Washington, at Pullman, Washington, began eleven years later, in 1952. On December 17, 1952, I wrote a three-page detailed letter on Yoder research, addressed to "My dear Distant Cousin," and he responded with a three-page letter on December 23, addressed to "My dear Cousin Don Yoder". While both letters deserve publication sometime later on in the YNL, I feel it important to quote here several paragraphs from his letter to me. "About ten years ago, there died in the city of Seattle Professor A. H. Yoder who was a descendant of the North Carolina Yoders, his ancestor having gone to the State of Indiana in the early 1800s. Prof. A. H. Yoder had made the most thorough study of the North Carolina Yoder family based on first hand investigations and looking over documents that I have seen. I had two extended visits with him shortly before his death and he showed me the materials that he had collected. It is my intention to go to Seattle and see his widow and children and go over the materials that he left before I proceed to North Carolina next summer. I have no doubt that the Wallace Yoder of Litchfield, Illinois, that you mention in your letter, is one of the descendants of these Indiana Yoders, and that he may also have had contacts with A. H. Yoder who lived in Indiana, Wisconsin, North Dakota and finally the state of Washington." The scholar that he mentioned was Albert Henry Yoder, whose work on Yoder history I have come upon elsewhere. He is said to have visited the Oley Valley in his search for Conrad, since Conrad and his North Carolina associates the Weidners lived there and migrated South from that important Yoder area. Personal collections of genealogical data are often, alas, destroyed when the genealogist dies, but in this case the papers were left to the archives at the University of North Dakota where the late Hubert A. Yoder of Charlotte, NC, tracked them down and wrote about them in YNL21. Fred Roy Yoder in his letter also makes the statement: "In view of the fact that your own branch of the Yoder family belonged to the Reformed Church and not the Mennonite Church, and that Conrad Yoder also became a member of the Reformed Church in North Carolina, it may be that he was never a member of the Mennonite Church which supposition my grandfather often related to me." writing and publishing his North Carolina Yoder history, for the revised edition of which I am writing a lengthy Historical Introduction. I have also valued my association with Fred Roy Yoder's family, particularly with his daughter Elaine Zakarison and her children. 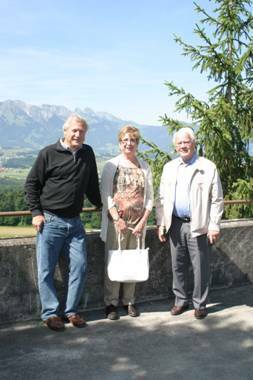 And it was a distinct pleasure to have Elaine and several of her children in my 2002 Pennsylvania German Heritage Tour (see YNL40), where I could introduce them to the Swiss and Palatine homelands of our European Yoders. And I must not fail to mention that in the 1950s I had the pleasure of entertaining Dr. and Mrs. Fred Roy Yoder at my home in Devon, Pennsylvania. During that visit, accompanied by lots of Yoder discussions, I took Fred Roy and my father on a memorable tour of the Oley Valley. Finally, unexpected references to Conrad Yoder have occasionally turned up elsewhere. One of these is in the 625-page Deppen Genealogy, Counting Kindred (1940, reprinted 1983), a book which is extremely relevant for the North Carolina migration. It deals with a Swiss family with Steffisburg connections, although thus far I have found no links to our Steffisburg Joders. However, this detailed, well researched book contains vital chapters on the branches of the family which pioneered in North Carolina, the Carpenters in particular. In the chapter on the emigrant Christian Deppen's oldest daughter Barbara, wife of Peter Zimmerman (later Carpenter) of Lincoln County, North Carolina, there is a curious reference to Conrad Yoder. In the book's brief section on Henry Weidner (Whitener), who patented his North Carolina land as early as 1750, the statement is made, "On one return trip [from Pennsylvania] he brought a wife Mary Mull and a youth Conrad Yoder - ancestors of a large and esteemed posterity" (p. 226). Comment: Conrad was hardly a "youth" in 1762 - he was 37 years old! But this family tradition, for that is what it must be, could indeed refer to Conrad's probable living with and apprenticeship to the Weidner brick-making business in the Oley Valley. In my rush to finish this preliminary report on the Conrad Yoder Mystery, for Chris Yoder's October issue of the YNL. I have not analyzed several important sources on Conrad, but promise my analysis for the April issue. I sent across the Atlantic a dozen letters to Palatine archives and scholars whom I know personally, and expect detailed letters from them this Fall. German archivists are meticulous in answering legitimate queries from America, and I expect some good stuff to share with you all! Among the American sources that I will comb for additional Conrad Yoder references are of course Dr. Fred Roy Yoder's North Carolina Yoder genealogy, Eaker's magnificent book on the Pennsylvania Dutch element in Western North Carolina, and the new and splendid two-volume history of Catawba County, supervised by Sidney Halma, Director Emeritus of the Catawba County Historical Society. There are also other North Carolina sources that will add new local color to my presentation - notably the book on the Great Wagon Road, and the fascinating book on the Carolina Back-Country. Please graciously pardon my not citing complete bibliographical data on these works, but as I intimated, I am under pressure at the urgent call of Chris Yoder! But in conclusion let me give just a teasing bit of description of the two Palatinate towns that Conrad Yoder lived in -- Mussbach and Weidenthal. We will start with Weidenthal. Neustadt, the central city that both Mussbach and Weidenthal looked to for marketing activity and governmental supervision, is on the edge of the forested Haardt mountain range -- which looks very similar to our forested Pennsylvania mountains -- and it overlooks the vast Rhine Plain dotted with red-roofed villages and unbelievably vast vineyards. Neustadt is the equivalent of the county seat for both of Conrad's towns, and in Conrad's time it was the capital of the Oberamt (administrative district) of Neustadt under the Electoral Palatinate government at Heidelberg and Mannheim. Weidenthal, which means "Willow Valley," is a pleasant little town on the railroad from Neustadt to Kaiserslautern, a stretch that winds through the mountains and proceeds through numerous tunnels. Weidenthal is literally in the woods. There are ancient farms in the parish like the Laubscherhof, but most of the inhabitants in the 18th century either raised cattle, which they were familiar with in Switzerland, or worked in the forests as charcoal-burners, potash-burners, or lumbermen felling the trees for sawmills (Yoders love sawmills, and my Grandfather Yoder had a locally famous sawmill on the Pine Creek in Hegins Valley in Schuylkill County, that I saw in glorious operation many times when I was a boy). In Conrad's time of course there was no railroad, so the Weidenthal farmers and woodsmen took the winding trek to Neustadt, on foot, on horseback, or with horse and wagon. Mussbach, which means "mossy creek," is a smallish town with interesting eighteenth-century farmsteads where the dwelling houses adjoined the barns around a central courtyard, and a fine Reformed parish church, with which Conrad and his father Nicolaus Joder Sr. evidently were connected. And let me add a personal note. On my latest visit to Mussbach, with Karl Scherer, the former Director of the Heimatstelle Pfalz in Kaiserslautern, now the Institute of Palatine History and Folklife, we had a celebratory luncheon at one of the best restaurants in the present day Palatinate. Oh, those magnificent Dampfgnepp mit Weinsauce (Steamed Dumplings with Wine Sauce), which my Grandmother Yoder called Schwowe Gnepp (Swabian Dumplings) since her heritage was Swabian rather than Palatine). And Oh, that incomparable Grumbiere-Supp (Potato Soup), and Oh, those choice Brodwarscht (Smoked Sausages) on a bed of succulent Sauerkraut - just like at home in Pennsylvania! Oh! Oh! Oh! All that accompanied by glass after glass of cool, refreshing Mussbacher Eselshaut! I consider this a Conrad Yoder meal, since all these Palatine specialties would have been part of Conrad's growing up in his home town of Mussbach. And they also became standard dishes on the Pennsylvania Dutch table. I remember them all, except for the wine sauce on the dumplings. Alas, at that time I had not yet found that Conrad had lived in Mussbach, or I would have toasted his memory with a festive glass of Mussbacher wine. Next time - I promise to do so! In a very real sense Conrad is the missing link in the Yoder chain that ties everything together. 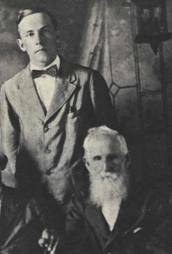 Conrad's story links the Palatine and Pennsylvania Yoder clans, unites the Berks and Montgomery County Yoder households, and opens the kinship door to all the Lahrs, Rauchs, Shultzes, Stürtzmanns, Hersteins, and all these other "beloved cousins" of his affectionate nephew Daniel. And now, a fond farewell to my North Carolina Cousinry, whom I hope to greet at the Yoder Reunion in Hickory this October, where I will present an expanded version of this preliminary report, and publish all the new data in the April issue of the YNL. Over the past 29 years, subscriptions have allowed us to support advertising of national reunions, to provide funding for many of the DNA tests, and to pay for new research into Swiss records. All of our staff members are volunteers. My husband, Eric, and I spent one of the best days of our lives in May visiting with Andreas, Hans, and Anna Joder. I would call Thun and Steffisburg more than quaint...how about a glimpse of heaven. Our ancestors must have really been harassed in order to leave such a beautiful place. Andreas and Hans spent the day showing us all the places of interest in both Thun and Steffisburg. After more than twenty years of research and effort, well known Amish historian Leroy Beachy tells the "Story of the Amish" in this beautiful two-volume set, with leather-like binding and packaged in a slipcover. Each volume is over 500 pages, and there are nearly 300 illustrations by the author. Order directly from the author for $75 plus $8 postage. Make check payable to: Goodly Heritage Books, 4324 State Route 39, Millersburg, OH 44654, phone (330) 893-2883. In the last YNL issue, Dr. Don Yoder described the revelations from a recently found 1777 Indenture of Release settling the 1741 estate of immigrant Yost Yoder (OY) Oley Twp, Berks Co., PA. The Release had been gifted in 2010 by Robert Conwell of Westport, Indiana to the Berks County Historical Society. All that was known of its origins was that it had been in the family of Robert's brother-in-law Fred Irwin (1902-1966) "of York, Nebraska". Fred had married Robert's sister Lucille in 1932, and it was said that his mother had been a Yoder. He is from the Yost line, through son Jacob, but his children are all a generation older than "Mamie" and he had no known sons to give him a Yoder granddaughter. 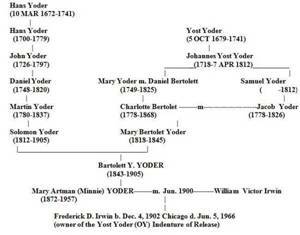 Bertolette Yoder does have a daughter of the correct age, named "Mary" instead of "Mamie", but he is descended from Hans Yoder (OH), not his brother of Yost. Could we find any more about what became of Mary? The YNL had not previously gathered any information about her marriage. By going to the genealogical site "Ancestry.com" and checking several combination of names, we were able to find that this girl was "Mary Artman Yoder" and that she married "William Victor Irwin" and they did have a child Frederick "born about 1902" in Illinois. Eureka! But how to explain that this Yost Yoder family treasure was to be found in the line of his brother Hans? Building a family tree for Bertolette (aka Bartolett) begins an answer to our question (see tree). His parents were both Yoders. His mother Mary Bertolet Yoder (1818-1845) was the granddaughter of not one, but two grandchildren of immigrant Yost! Her parents were first cousins. Mary who married Daniel Bertolet (featured prominently in the YNL57 article) was the second child of Johannes Yost Yoder, and her older brother apparently died without issue. Samuel was one of the younger children. It at first would seem most likely that the Indenture was passed down in Mary's family- especially in light of the decided historical interest of the Bertolet family generations (her grandson Dr. Peter Bertolet writing an 1860 history of the Oley Valley). But if the document did indeed come down in that line, why wouldn't Dr. Bertolet have had access to it (his aunt Charlotte was still living when he wrote his book) to give a more accurate picture than he did of the family Yost Yoder? Perhaps we shall never know the exact path this document took, but we are certainly glad it has been preserved and its information now made available to us all! Visit the site at: www.findagrave.com . Already recorded are interments for: as of Aug 31- 8,854 (an increase of +1,286 from Feb 2011) –Yoder; 241 (+46) – Yother; 97 (+44) – Yothers; 123 (+6) – Yotter; 37 (+4) – Yoter; 98 (+41) – Yoders;, 13 (+2) – Ioder; 64 (+12) – Joder; 24 (+5) - Jotter family members; Joders - 1 (+0). You can either add your ancestor to a cemetery, or post data on an existing record. For assistance write: Chris Yoder at: cyoder@tds.net . -Col. Harry David Yoder, 95, from Boyertown, Berks County, PA, passed away on May 8, 2011 at Berks Heim Residence in Bernville. 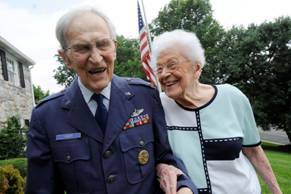 Colonel Yoder is survived by his wife of 65 years, Ardath Davidheiser Yoder. He was born in New Berlinville, to the late Paul and Gertrude (Landis) Yoder. Col. Yoder was the senior and active member of the Oley Yoder family association. On July 4, 2011, the Pennsylvania State Legislature passed House Resolution 338, to honor his service as retired Air Force officer, World War II, Korean conflict and Vietnam veteran. His exciting life story is well worth retelling in a future YNL. In the year and a half since we took the The Yoder Newsletter into the "Facebook world" with a "fan page", we have grown to have over 490 fans! This adventure has brought us into contact will a broad new audience and, as can be seen from some of the items in this newsletter, has been a means for sharing Yoder news and gathering family items of interest….Hurrah! ANY GOSHEN INDIANA RESIDENTS OUT THERE who might be available to volunteer to help with the Yoder Newsletter? Our staff is aging and could use a hand. A couple hours a week to pick up and process the mail from the P.O. Box, deposit subscription checks, updating the address file before each issue and envelope stuffing when mail time comes. If you might be able to help, write: Chris Yoder, cyoder@tds.net or call: (269) 857-4327. On July 16 a gathering of 25 descendants of the Oley Yoders gathered at The Bridge Inn in Pleasantville, PA to re-establish family ties and enjoy each others company as well as the delicious dinner the restaurant had prepared. This year's reunion was dedicated to the memory of Col. Harry Yoder who had passed away on May 8. After our socializing, Kathy Lesher, a fifth generation herbalist, presented an interesting talk on the uses of local herbs by our ancestors and the local Indians. It was especially interesting to hear how the natives used the compass points and colors in their herbal interpretations. We each received a potted herb that had been a table decoration to take home. Ron and Shirley Yoder from Alexandria, Virginia were awarded the prize for having traveled the longest distance. Other prizes were awarded to William "Bill" Yoder from Kutztown, PA as the oldest man at age 93. Edna Dierolf as the oldest woman at age 91, Rachel Balderrama as the youngest woman at age 19, and the youngest male attending was Ken Yoder from Palm, Pa who is 70 years old. .
Before the festivities ended, a raffle was held for a table full of prizes and gifts. We hope to see more Yoders at next year's reunion and in the mean time we want to wish you all a Happy St. Yoder's Day on August 16th. Dr. Don Yoder to Speak On The Discovery of Conrad Yoder Origins!! When plans were made for the 61st annual reunion of the Yoders of North Carolina, little did we suspect that the answer to our Conrad Yoder mystery would be in hand. Last minute arrangements are in process to bring Dr. Don Yoder to speak at the main program event. - 9:30 am- Hart Square Folk Festival (10:00 am-5:00 pm) – May be sold out for those who have not already reserved tickets. NC YODERS HOST NATIONAL YODER REUNION IN OCT. 2012-PLAN NOW!!! ARTICLES SLIPPED TO ACCOMMODATE "SPECIAL ISSUE"
You can look forward to learning about each of these topics in a future issue of the YNL.